Sabian 13" Hi-Hat Holger Müller Sign. 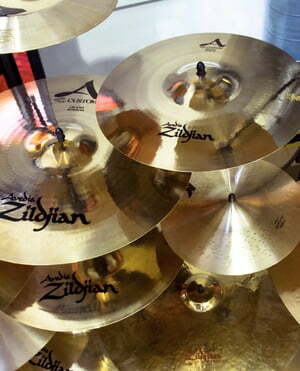 These hi-hats have a well balanced dark tone with a very crisp and well defined closed hit and stepped sound. When played open, they project very well and cut through a full band of distorted guitars, bass, keys and vocals (which I found surprising, given their dark tone). Also great for recording ballads as well as full-on metal songs. I have yet to use them live to judge how they sound on stage. Beautiful lively sound, powerful presence. Sticking very clear and accurate. This hi-hat does not leave a stop unheard, no matter what environment and dynamics is used. Hi-Hats Natural&comma; B20 alloy&comma; HHX cymbals unite the warm&comma; dark tone of the HH series with the direct and modern response to the AAX series&comma; Sabian&apos;s winner of the "Player&apos;s Choice"
ID: 165364 © 1996–2019 Thomann GmbH Thomann loves you, because you rock!